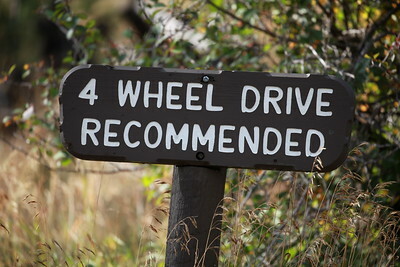 The message of this sign is that the road ahead is not for the average vehicle visiting a national park. A secondary message to a nature photographer is simply that the area must be a little wilder with fewer people than other locations, thus, the probability of seeing wildlife increases significantly. More than likely, at some point not too distant the mode of transport will be hiking with a camera bag, tripod, water, bear spray, knife and various light-weight emergency items. It is at that point that the excitement truly begins. 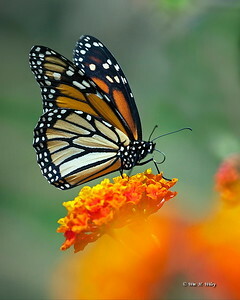 The monarch butterfly may be the most familiar North American butterfly and is considered an iconic pollinator species. Its wings feature an easily recognizable black, orange, and white pattern, with a wingspan of 3½ to 4 inches. Studies attribute the ten-fold decrease in the eastern monarch population from 2006 to 2016 to the loss of breeding habitat due to herbicides used by farmers and homeowners on milkweed, a plant used as a food source by monarchs. 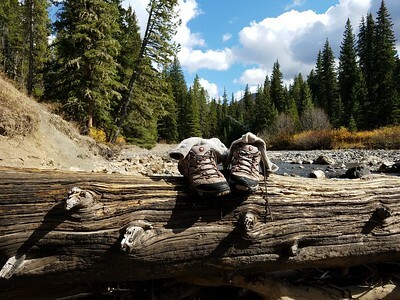 After three weeks in the Rocky Mountain wilderness I now feel every rock I step on, so it’s time to retire my hiking boots. They’ve served me well on many trips, but the terrain is oftentimes too rough to wear boots that can’t safely carry my weight plus an extra 25-35 pounds. I’m sure Cabela’s will be glad to see me once again! 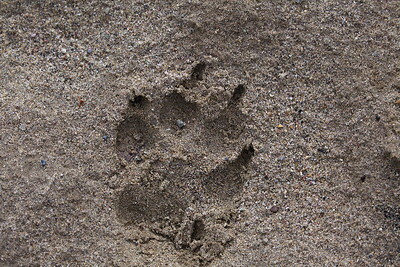 Found along stretches of Pacific Creek in Grand Teton National Park were wolf tracks imprinted in sand, gravel and mud, which all gave different impressions, with mud usually being the most distinctive. 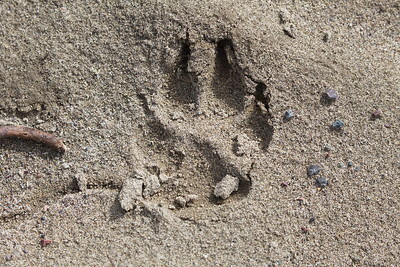 Determining that tracks are from a wolf, versus a coyote, fox or dog, can be based on size, gait, pad separation and shape. Tracking predators stirs one’s imagination about how long ago the animal was there, its current proximity and if even the tracker could be the one being observed. 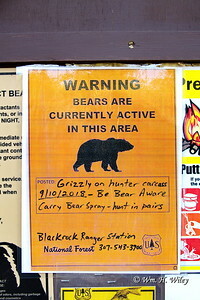 Arrived at this trailhead 9/11/18 and saw this sign posted the day before. Grizzlies may return to a carcass multiple times, so the possibility of an encounter was quite probable. And, an encounter could be anywhere in the woods, not just near the carcass. Even though I always carry bear spray on my belt, the woods were too thick and visibility too poor to hike safely. My goal was to look for images, not get mauled. Knowing the inherent dangers of proceeding, I decided to choose a different trailhead for my photography. 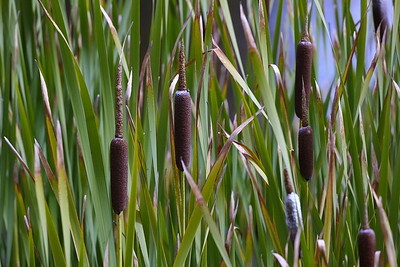 Cattails, also known as corn dog grass, are tall sturdy plants that can grow to nearly 10 feet tall. Underwater, they provide a safe haven for tiny fish and attract many of the smaller aquatic creatures that birds and other wildlife feed on. They also create a shelter from winter cold and wind for mammals and birds and a source of nesting material with their leaves and seeds. During WWII, cattail “cotton” from the cattail’s fuzzy heads was used in life belts and aviation jackets due to its amazing buoyancy properties. 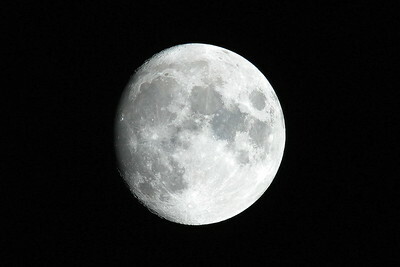 At 239,019 miles from earth, the moon is the only place beyond Earth where humans have set foot (24 human visitors). It is the brightest and largest object in our night sky, and it makes Earth a more livable planet by moderating our home planet's wobble on its axis, leading to a relatively stable climate. It also causes tides, creating a rhythm that has guided humans for thousands of years. The Moon was likely formed after a Mars-sized body collided with Earth. Humans have studied the moon for thousands of years, but we didn't see its far side until a spacecraft got there in 1959. The moon rotates once on its axis in about the same time it orbits Earth, so the same side faces us at all times. Research has shown that the Moon's weak atmosphere and its lack of liquid water cannot support life as we know it. Often found in tropical and subtropical regions of the world, the Panther Lacewing butterfly is considered one of the most beautiful butterflies in the world. The distinguishing characteristic between the Panther Lacewing and the North American Monarch Butterfly is the zig-zag white stripe on its wingtips. With tongues hanging and gasping for breath, twelve sled dogs race down a trail in the International Sled Dog race in Anchorage, Alaska. The race pits sprint mushing teams against each other over three days of the same 25-mile route for a total of 75 miles. Some of the most common breeds of sled dogs are Alaskan husky, Alaskan malamute, Canadian Eskimo, Chinook, Samoyed and Siberian husky. 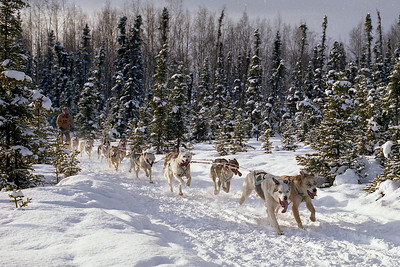 The Iditarod Trail Sled Dog Race is an annual long-distance sled dog race run in early March from Anchorage to Nome, Alaska. Mushers and a team of 16 dogs, of which at least 5 must be on the towline at the finish line, cover the distance in 8–15 days or more. The Iditarod began in 1973 as an event to test the best sled dog mushers and teams but evolved into today's highly competitive race. In 2017, at the age of 57, Mitch Seavey, was the oldest and fastest person ever to win the race, crossing the line in Nome in 8 days, 3 hours, 40 minutes and 13 seconds. 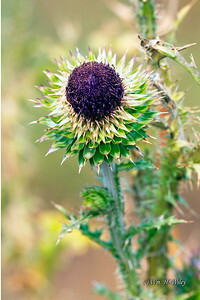 Thistle is the common name of a group of flowering plants characterized by leaves with sharp prickles on the margins, mostly in the family Asteraceae. Prickles occur all over the plant – on the stem and flat parts of leaves. They are an adaptation that protects the plant from being eaten by herbivores. Thistles attract goldfinches and thistle-seed feeders and are an important nectar source for pollinators. Bumblebees benefit from thistles for their high nectar production while the monarch butterfly relies on taller large-flowered thistle species for its migration. Photographed on a cloudy day in autumn, the various colors of several plants show that the seasons will soon be changing. 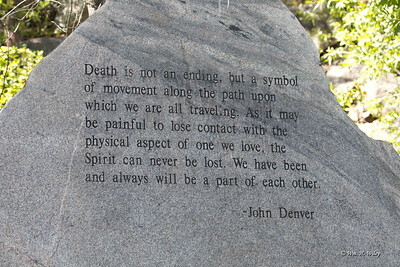 John Denver’s quote about death is inscribed on a rock in the John Denver Sanctuary Aspen, Colorado next to the Rio Grande Park. Next to the Roaring Fork River, the Song Garden features many of the iconic singer's lyrics etched into native river boulders placed in a perfect circle to represent the circle of life as a score of music. At the circle's center, a single Colorado Blue Spruce was planted to symbolize the spirit of John. The man-made wetlands and winding streams work as an innovative stormwater filter system, cleaning water before it drains into the Roaring Fork River. Within the Sanctuary is one of the largest perennial flower gardens open to the public, which adds to the friendly atmosphere for its visitors from around the globe. 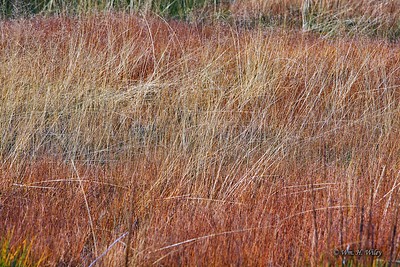 In the Twin Lakes area of Yellowstone National Park, this tall autumn grass grows along the shore of a remote stream. Not long before this picture was taken, a coyote trotted through the grass, looking for mice or other small mammals. Butterflies are notable for their unusual life cycle with a larval caterpillar stage, an inactive pupal stage, and a spectacular metamorphosis into colorful winged adult form. Most species are day-flying and their diverse patterns formed by their brightly colored wings and their erratic yet graceful flight makes butterfly watching a popular pastime. Some butterflies are known to migrate over large distances. 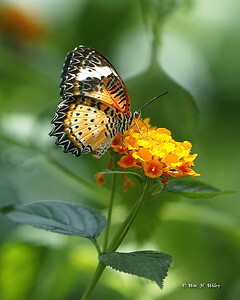 Butterflies are important economically as one of the major agents of pollination. 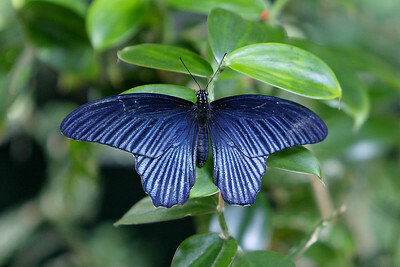 This deep blue butterfly was photographed in Callaway Gardens in Georgia. 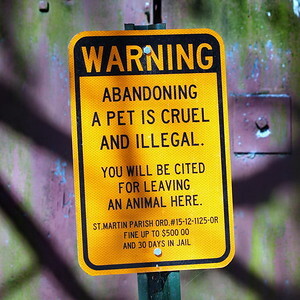 On the shore of a southern Louisiana bayou, a sign conspicuously points out that abandoning a pet is “cruel and illegal.” Considering that alligators and other meat-eating creatures inhabit the bayou everywhere from its shoreline to the middle of the swamp, the thought of anyone dumping their dog or cat to fend for themselves is abhorrent. The smooth serviceberry (amelanchier laevis) is a North American species of trees in the rose family, growing up to 30 feet tall. It grows primarily in eastern Canada and the eastern United States. 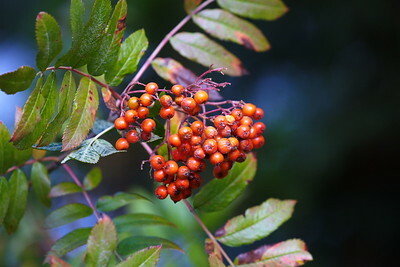 The fruit, which are pomes, are edible and can be eaten raw or cooked. The fruit has a sweet flavor. The bark can be made into a herbal medicine for expectant mothers. It is a deciduous tree and is sometimes cultivated as an ornamental shrub. Forests of lodgepole pine trees cover up to 50 million acres in the western regions of North America. Named because Native Americans used the straight and slender poles of the trees to support their lodges, lodgepole pines can grow up to 150 feet and live up to 400 years. They grow in areas with minimum temperatures of -70 degrees Fahrenheit in the northern Rocky Mountains to 100 degrees Fahrenheit in lower elevations. 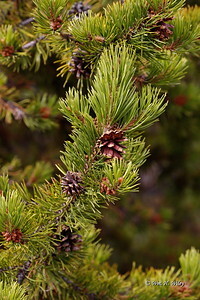 Lodgepole pines produce viable seeds early in their lifespan, around five to 10 years, and they are prolific seed producers, with seeds stored in cones remaining viable for years. In fact, the cones have a resin between their scales that only breaks when temperatures reach 113 Fahrenheit to 140 Fahrenheit, making them among the first trees to repopulate areas after forest fires.